Howie and I have kind of a fun background story. We were childhood sweethearts in high school growing up in Duncan here on Vancouver Island. In university we went our separate ways and I ended up moving to California. While there I got married, raised a family of three and went into business with my first husband for twenty-six years. Howie also married and had five kids of his own. When my kids were grown I chose to start a new life and move back to Canada. I reconnected with Howie thirteen years ago who was also on his own and we have been together since, married and enjoying our grown children and grandchildren! While I lived in California in a little coastal town called Fort Bragg we had a house with a small grandmother cottage that was perfect for a vacation rental. We renovated it, started to rent it by the night and found it was a lot of fun! We had people come to us from all over the world and they always had interesting stories to share. One of my favorite experiences was a weekend when my cousin and her husband were visiting for one night. They were planning to go camping for a week and thought they would test out their tent in our back yard for the night. At the same time I had an interesting surfer "dude" who wanted to rent our cottage for the weekend. Each conversation with him on the phone started with "Hey dude!". He booked for three people and then over three more calls kept adding people. The cottage slept four so we agreed the other people would bring sleeping bags and sleep on the floor or on the deck. When the weekend came and our surfer dude and company and my cousin showed up everything went really well. As the young fellow and friends were leaving he said,"Hey dude, you guys are so cool to let us all stay here, you even rent out your lawn!" We had a good laugh. I really enjoyed hosting people on our property in California so my husband, Howie and I thought this would be a great way to work into our retirement years. Howie and I are finding having a bed and breakfast as satisfying and fun and as we hoped it would be! We look forward to meeting you and helping to create a vacation worth remembering! many amenities for a comfortable home away from home vacation. We offer an electric fireplace, flat screen TV with Netflix, WIFI, microwave, small fridge, coffee and tea, and ensuite bathroom. 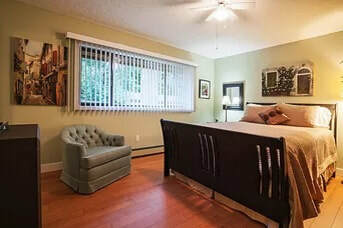 The suite also has a cute second bedroom with a queen size bed for an additional one to two guests (adults or children). This bedroom has a flat screen TV, Netflix and WIFI. The guests will share the ensuite bathroom in the main bedroom and has a bathroom with sink and toilet close to the suite. 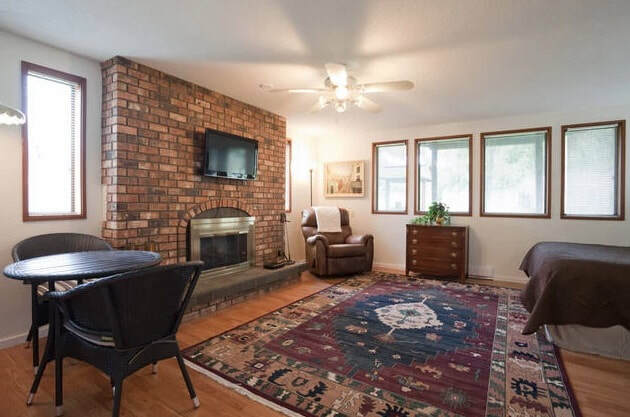 This room leads out to an enclosed sun room for the perfect place to have your morning coffee and continental breakfast or a relaxing evening chat with wine and stars. ​Included is a comfortable roomy living room with flat screen TV, Netflix and WIFI, lots of games to stretch out with friends and family. There is also a Lazy Boy queen sleeping sofa for 1 to 2 more people. Our Guest House was my grandmother's home on my parent's property, built for her when my grandfather passed away. It was constructed with an open concept and vaulted ceiling to make it feel large and welcoming. 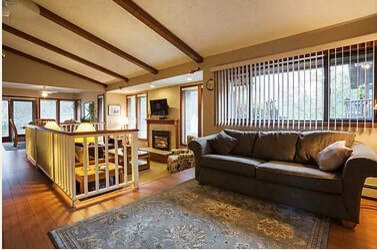 The house is a spacious 1150 sq ft with attached deck, barbecue and private parking. We also recently installed a heat pump so the guest house has air conditioning, heat and a propane fireplace. We have always loved the Guest House and the memories of my grandmother Petie. She made heavenly bread, cakes, cookies and many other delights! As children or adults we loved to lick the spoon when she was baking! Our favorite was Granpa cookies. If you would like some, let me know and I will whip you up a batch! We hope you will choose Petie's House and create your own lovely warm memories! The house has one bedroom with queen size bed and an alcove with a Lazy Boy queen size sleeper - very comfy. We also use Comphy Co sheets which are incredibly cozy and get softer with each washing. Romantic sunken living room with propane fireplace giving warmth and intimate experience. The large kitchen and dining area with island is complete with a full size fridge, stove, built-in microwave, dishwasher and laundry facilities. Perfect for making small to full meals and small group gatherings! hat perfect cup of tea. We provide regular/decaf, dark roast and a range of teas. 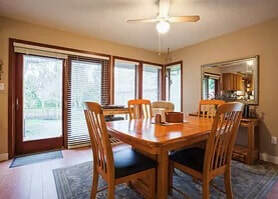 ​The dining area has a comfortable lovely oak table with great views of the yard. spread out and feel at home.memories. Queen size bed, flat screen TV in the bedroom, WIFI and netflicks. ​The deck has a table for 4 and very private so you can relax for great chats and a glass of wine. ​ we live and how relaxed they feel during their stay.